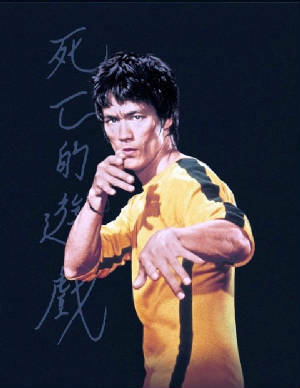 Certain Specifics formed the basis of Lees JKD. 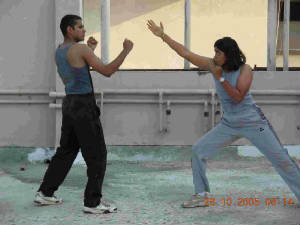 These were distinctly separate from other Martial Arts and added individuality to Jeet Kune Do. Certain specifics of Stance, Straight Lead, Body alignment, Footwork and Kinetics constitute Lees JFJKD. It is beyond the scope of this site to outline these, so only general guidelines are presented below of JKDC. The aim of the art is simply to cripple, immobilize or eliminate, in the shortest possible time with the most minimum of effort. 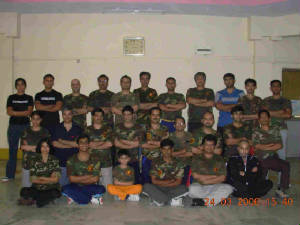 There is no place for techniques which dont achieve this goal, as this is not about point fighting or sport combat. The stance is a narrow upright one, permitting quick springy movements, inspired by Western Boxing. It may be matched or unmatched. This is a street wise stance compared to the deep wide stance of karate. Footwork is from Fencing, is quick & springy, with a One sided Lead Stance prevailing. Economy of movement, with only small minimum movement. Balance developed is Dynamic, in motion, rather than in static stances. Deflective Parrying is preferred to rigid blocking. Fluidity & flowing with the opponents force is advocated. Resisting force is discouraged. Interception is preferred over Parry & Counter. Lead Hand/ Foot Attacks are preferred. All attacks are indirect with feints. Attacks are non focussed, going thru the target. Non Telegraphic fast movements are advocated to Telegraphic ones. 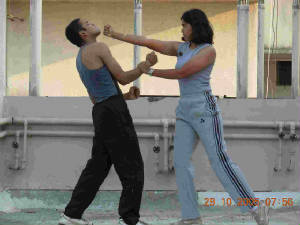 Hammer Principle is used by throwing the punches & kicks from where is. Also at the end of one technique you learn to position the limb to launch another technique. Fighting is dynamic with Ranges changing from moment to moment. Each exponent personalizes the art to suit his requirement, his size & his skills. Rhythm is a broken one, and never regular attack parry counter type. Range fighting is a characteristic feature. The foul Tactics are absorbed & the limitations/ rules are rejected. There are specific techniques like the “Straight Blast” used to quickly enter with fast footwork, bridge the gap, trap the opponents hands and straight punch him to knock him down.